Both stores have launched online sites.!! 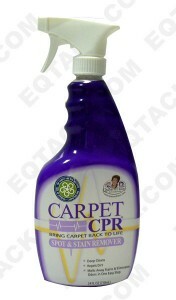 If you shop at Carter's be sure to use coupon code CCC20 and receive 20% off your entire purchase. 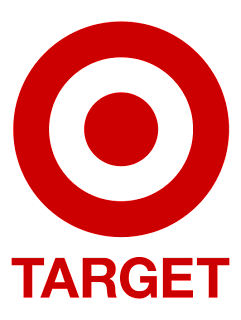 Also, Spend $50.00 or more and you get free shipping. If you head Here you can shop at OshKosh. AND you can use coupon code PCC20 to get 20% off your entire order. 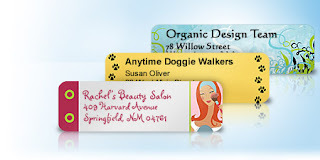 *****Also note, if you sign up for either sites clubs, you will receive promotions and coupons by mail. Oh boy! Have any of you guys been watching it? As I have said before, I never intended on watching this season, however, I was curious to see Kate - as in Jon and Kate plus 8. Well, tonight is the fist elimination and I honestly think that she will go before Buzz. I mean this woman is just awful. I give her credit for having the gaul to get up in front of millions and strut her stuff BUT!!!!! !My GAWD is this woman awful. What makes it worse is that not only is her dancing awful, but so is her attitude. She had a "blow out" with her "professional" partner. She was criticizing the way he was teaching her!!!!!!! Are you serious Kate? I was so hoping and praying that I would see her on the show and see that she is a nice person. Let me tell you, she does not seem nice. Poor Tony, her partner. I bet folks, he is betting they are the first to go. I sadly have to announce I did vote for her on Abc.com and let me tell you, I am kicking myself in the arse!!!!! Heavily sedated because of the pain of his heart attack, he dimly saw the young uniformed Marine standing outside the oxygen tent.. He reached out his hand. The Marine wrapped his toughened fingers around the old man's limp ones, squeezing a message of love and encouragement. The nurse brought a chair so that the Marine could sit beside the bed.All through the night the young Marine sat there in the poorly lighted ward, holding the old man's hand and offering him words of love and strength. Occasionally, the nurse suggested that the Marine move away and rest awhile. He refused. Whenever the nurse came into the ward, the Marine was oblivious of her and of the night noises of the hospital - the clanking of the oxygen tank, the laughter of the night staff members exchanging greetings, the cries and moans of the other patients..
"No, he wasn't," the Marine replied. "I never saw him before in my life.."
Knowing how much he needed me, I stayed." The next time someone needs you ....... Just be there. Stay. Today I awoke to the morning news and they had a story about a man who had lost his leg to a drunk driver. That in it of itself is a story. However, the story was not about that. The story was about how this man forgave this woman for what she did. He read a victim impact statement in court that was short, all of about 2 minutes. However, in that statement he told the woman that he knows that she is suffering, her family is suffering and he forgives her for what she did. With that, the man then gave this woman a hug. I sat there for a moment in silence. "WOW!" I thought. What an incredible human being he is. To be able to forgive this woman who left him with only one leg. This man has three children and although he has an artificial leg, he will never be able to fully enjoy running around and being a dad with these three children. This woman took something so very precious away from him and he forgave her. It got me thinking to other things. For instance, with the latest on the Jesse James and Tiger Woods infidelity scandals, do their wives forgive? And with the 15'th Anniversary of the Susan Smith Story - you know, the woman that killed her two kids by making the car roll in to the river. Does her ex husband forgive? Without getting too religious, I know that the bible tells us we must forgive. However, I am not sure in all of these instances, I would be able to. The infidelity - definitely not. I think any one that cheats and says they have an addiction is using that as a cop out. I do not beleive there is such a thing as a sexual addiction. And if anybody, I don't care who they are EVER did anything to any one of my kids, I know I could never forgive them. I mean, I flew off the handle when my oldest came home and tells me his teacher made a spectacle of him in front of the class. Forgiveness is a powerful thing. They say that you can forgive, but you never forget. I'm sorry, you do me wrong your not getting my forgiveness and you can be damn sure I'm not going to forget about it. I look at people who are able to forgive certain awful things and I admire them in a certain way. It is truly hard to forgive and to be able to do it, I mean really do it, you have to be a very strong person. On the other hand, people that forgive others that do them wrong ie cheating, they are just plain old stupid! Have more respect for yourself!!!! o.k. o.k. that was daily rant for the day :) Happy Monday! Print out these great coupons for Yankee Candle. I loooove Yankee Candle. Unfortunately with Aj's Asthma we can't have too strong of a scent in our home. I hope you guys enjoy. O.k. O.k. So it's not exactly Monday, but I have a busy day tomorrow.... Momma's gotta run around and get her deals . Thursday : Make your own pizza night - so fun!!!! and yummy!!!!!!! Hurry Up and grab this super cute keepsake.Head over to bTrendie.com and sign up. Just for signing up you will get a $10.00 credit. This super cute keepsake is marked down from 14.99 to 7.99 and shipping is a mere $6.95.. that means you snag this for $4.94 including SHIPPING!!!! 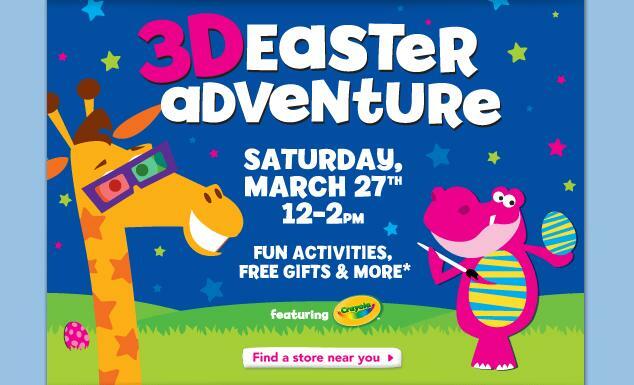 Head in to your local TRU tomorrow between 12 - 2 for some super cool activities, free gifts and lots more. As always, call first to make sure your Toys R us is participating. Here's a neat free sample. With this one you get (2) 2.5 oz bottles of Baby Wash and Baby Lotion. They are all natural and organic. Simply click the link below to get yours today! 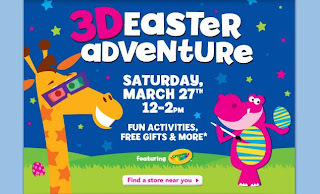 Head in to Michaels this Saturday between 10 - 1 (with the kiddies) and they can make this super cool spring craft. Don't forget, it's this Saturday between 10 and 1 and it's FREE!!!!!!!!! 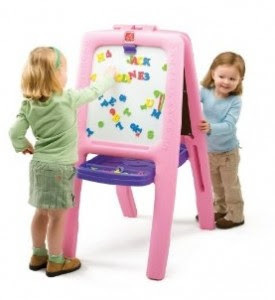 Hurry up kiddies, this one will go quick! http://Amazon.com has this Sylvania Blu Ray Disc player on sale for $59.99..... This is a STEAL.... if your in the market for one of these, I would grab it now. These Amazon deals tend to go quick. Good Luck. I said I wouldn't do it! Nope! I was sick of the less than interesting commentary from Tom Bergeron. And the Judges!!!!! ugh! C'mon , I can't even understand Bruno, Len (I think that's his name) in my opinion is too old to be judging a dance competition. o.k., o.k. he is a ballroom dancing judge. However, whenever the dancers try spicing it up, he HATES it. Kerry Ann I have nothing bad t say about her except when they say her name. It just gets under my skin......... Whew.... now that i just spewed all that at ya...I did watch Monday nights premiere. I have to be honest, I was really only watching it to see Kate Gosselin. Yes, I am a gossip junkie and with her recent tabloid headlines, I wanted to see how she did. part of me was sort of rooting for her. BUT after seeing her performance -MY GAWD!!!!!!!! Kate should just throw in the towel. Sorry Kate. And while we are one the subject of awful dancers - Buzz!!!!! Why oh why ABC do you find it necessary to bring in these "older" folks and embarrass them on national t.v. I understand he is an American Hero, but please don't put him in dance shoes.. that poor man had no rhythm at all. O.k. So what about "Jake the Bachelor" I mean really guy??? Did you not just finish up a reality t.v. show? Is it necessary for you to be on another one? Shouldn't you be spending your time getting top know your new Fiancee? AND when did reality t.v. folk become stars? When I hear the title of the show, "Dancing with the Stars" I'm thinking "Stars" not B or C list actors and certainly not reality t.v. stars - to those reality t.v. stars I say.. let it go.... your 15 minutes is up. Before I end I do want to say that Pamela Anderson you did surprise me. Although your dance looked more like a strip tease, you dance quite well.. Rock on!!!!! Here is yet another free photo deal. Sign up at http://cvsphoto.com and get 50 free prints in your welcome e-mail. I have been seeing another offer of where you can get 25 free prints. 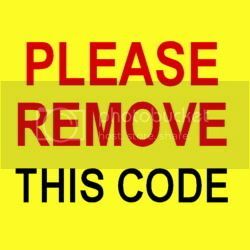 Simply enter promo code SAVE25. **Not sure if you have to wait for the welcome e-mail, but you can order your 25 in case you have to OR you can get your 50 free plus 25 (enter promo code above) and get 75 for free. Choose to pick up in store and they are totally free!!! If you have never been to Bjs before or just don't have a membership, you'll want to hurry up and print this 60 day pass out. It is good until July 5, 2010. Click on the link below. Hey guys it looks like yet anther company is hoping on the facebook bandwagon. Hopefully we'll reap the rewards from this one as well. 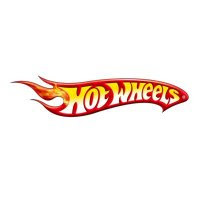 Simply become a fan of Hot wheels on Face book and get a special "thank you" next week. Can't wait to see what it is. 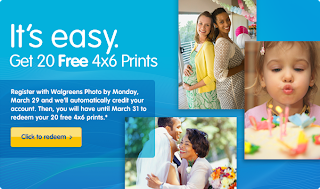 Sign up for an account with walgreens photo (by March 29'th) and get 20 free 4x6 prints. Choose in store pickup and you really get them for free!!! Not a bad deal. 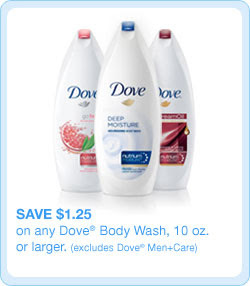 Head over to Walgreens this week where Olay Quench is on sale for 7.99 Plus you get a free shower lotion for free. 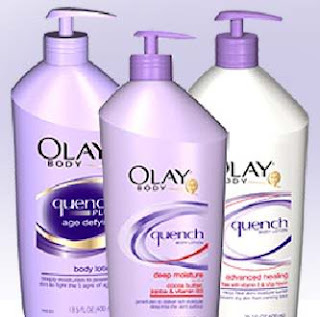 Submit Olay quench rebate and get both for free. As I sit here on another Monday morning, another weekend just a distant memory. I had so many plans for this past weekend, so many "projects" I wanted to do, and things I wanted to do as a family. But it seems as if I blink and the weekend is gone. Saturday it was absolutely beautiful out and I wanted to go to the Park with Daddy and Liam and possible feed the ducks. But Daddy was off taking care of some other business. O.k. I thought, We still have Sunday. I even got up early on Sunday so I - err rather we, could all take full advantage of the day. Although we did get some projects done, I feel like we didn't spend any time together as a family. Eric was off doing his projects and I went running around with Liam to score some deals at the stores. I wish we went to the park or at least went for a walk. But before we knew it, it was 7:00 at night! Where did the day go? Life passes us by so quickly. I know at least for me, I need to learn to slow down and enjoy the special moments with my family. It's o.k. to put off laundry another day, it's not going anywhere! I have to learn not to be such a neat freak and to not scowl at whoever leaves their shoes or toys lying around. I need to learn that when my kids leave their toys lying around, that's just them being kids, that's what kids do and as long as they are having fun, that's all that matters. I know that one day my kids will get older and not want me around so I must spend the time with them now to sit on the floor, get messy, play baseball - just be a goofy mom and hang out with them and create special memories with them. And with Eric, it seems like we are two passing ships in the night. By the time he gets home from work, it's dinner time and then he is so tired from working all day he usually hits the couch and his eyes are closed. I want to make it a point to engage in conversation with him when he gets home, give him a hug, a smile..anything but a rundown of how bad MY day was........We do have family dinner and that is a great thing. We all sit around and laugh and talk about our days. Sometimes I wish I could bottle up those times and relish in the memories. I thank God that he has sent Eric into my life and he has blessed me with such a wonderful family. Family is everything and I must remember that. I am going to cherish every second of everyday that God has given me with my loved ones. Sunday - Perdue Roasting Chicken w/ garlic mashed potatoes and peas. O.k. so with all the free codes between Redbox and Blockbuster Express, Eric and I have rented a few movies this week. I already reviewed the BOX and if you want to see what I thought about it, you can scroll down to my older posts. We rented 2012. I was kinda on the fence about renting this movie but I figured, "what the heck, it's free!" Well, I have to tell you that personally, I did not like it AT ALL. Eric enjoyed it though. This movie is like all the other "end of the world" movies you have your cast of "main Characters" That somehow escape the end of the world. You have your President wishing everyone well and lots of ridiculous action scenes that are so far fetched you have no choice but to laugh. My advice to you guys - don't waste your time! Another movie we rented was Law Abiding Citizen. Unfortunately, I fell asleep :( However, Eric watched it and he loved it. He told me about it and it sounded like a really good movie. I would have to say that I would definitely recommend it. I'm going to post these again. I have used both and they both worked for me. 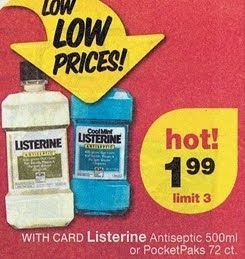 I am not sure when they expire so you may want to use them up quickly. Between the redbox codes and the endless Blockbuster Express codes Eric and I have been watching movies all week. I think we watched more movies this past week that we watched all of last year. O.k. so this pic is very fuzzy. But I went to CVS today and purchased 1 package of pampers and 3 bags of M&M's candy. These are the cutest! But you have to hurry for this offer because it expires tomorrow night! Head over to http://vistaprint.com and order your today. Here is what you need to do. On the left side you'll see "Home/Family Free products "
****If you become a fan on facebook of Jimmy Dean you get a $1.00 off coupon. 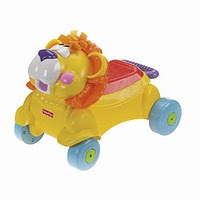 For Monday, March 22 - Save 40% on the Fisher Price Stride to Ride Lion. 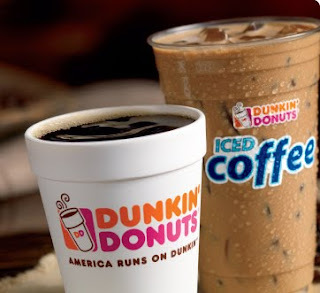 On March 23'rd from opening until about 10:30 a.m. you can grab a free pastry when you purchase a beverage. Simply copy and past the link below and print out the coupon. 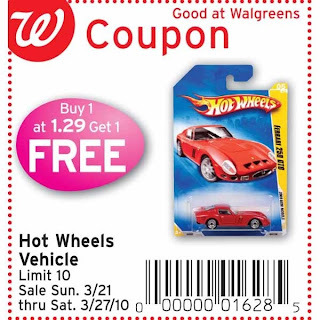 Head over to http://coupons.com to print out this great coupon. 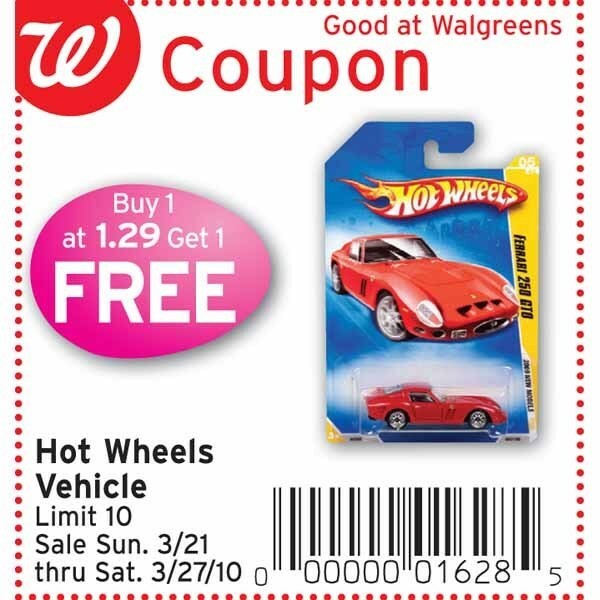 This will come in handy when they are on sale at C.V.S., Walgreens or Rite Aid(even better at Rite Aid if you also get a SCR) Keep those eyes peeled guys. 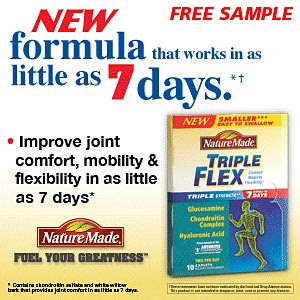 Click the link to get your free sample from Costco. You do not need to be a member for this one. 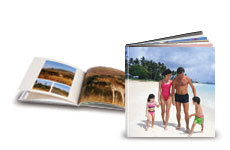 Free photostrip from Shutterfly... this one even ships free!!!!!!! !